WTB: HK trigger pack registered by Tim LaFrance of LS (LaFrance Specialties). *Offering $300 finder's fee for a lead that results in a deal closing. My eBay feedback, member since 1998. My HKpro feedback, joined 2-21-2010. PROJECT 41F filed July 12th, 2016 Delivered to agent July 14th, 2016. Check cleared July 18th, 2016. All stamps delivered to c3 on July 6th, 2017. Are you a LaFrance collector or just like his work? DLO packs are the exact same setup if you are looking for a registered box. Ha! Love it. If you are going to do something do it all the way! Most people probably settled with whatever they can find... not with Neo! Good luck with your quest... like a boss! Lol you sir are a madman, and I like it! Per the suggestion of coolhand, I just tracked down Tim LaFrance to see if he had anything set aside. Spoke with him minutes ago, he's still sharp and involved in the machine gun biz. Regarding rarity, Tim LaFrance checked his records and the last/final HK trigger pack that he registered was # 138. He also said, "There may be a few more but they would have been post sample by that time. He doesn't have any packs left or any finished machine guns for that matter, as he sold off everything years ago. 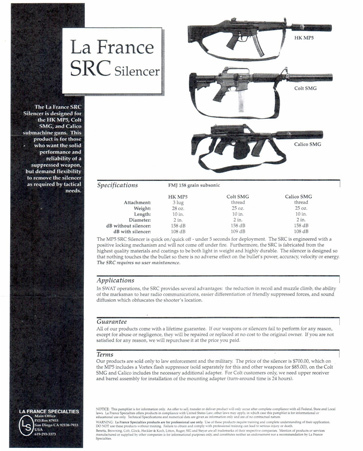 He mentioned a SRC MP5 3-lug silencer that he recently finished a batch of. I requested material on them by mail (he doesn't do email). 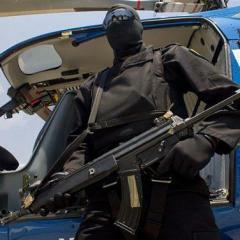 He said they were suited for 25k rounds, $600 each, and would be the quietest you've heard. Dang~ that's a bummer. With your will power, I'm 100% sure that you will going to find one. That man along with John Norrell are the pioneer of MG industry. I knew Tim made less than 200 but 175 seems even scarce... and you already have 2! Keep in mind that this 175 # was probably just his guesstimate. When I first asked him he said he’d have to check his records, but when I asked him again during the same call (doubt he had time to dig through those old records), he gave me the 175 quantity. From the LaFrance pack owners I've spoken to, the highest confirmed owned # is 100, and that someone says he knows someone with # 101. I'd really like to secure all 3 within 30 days, sooner the better because chances are it will be a form 3 from out of state. I suppose I have another month to find the next one before I'm getting dangerously close to the 41F sunrise. Good luck with your hunt for a FNC folder. 2. Any sellers having doubts working with Neo, he will have payment to you overnight, certified etc. He is quite verbose in his posts and gives solid details on all his transactions. Check out the references he gives on HKPro. I would be happy to work with him on a transaction. 3. Really cool getting to speak to Tim, please share the info on his silencers when it comes in. I'm passing on the information in case anyone else would like to order these while they are available and before the 41F sunrise. 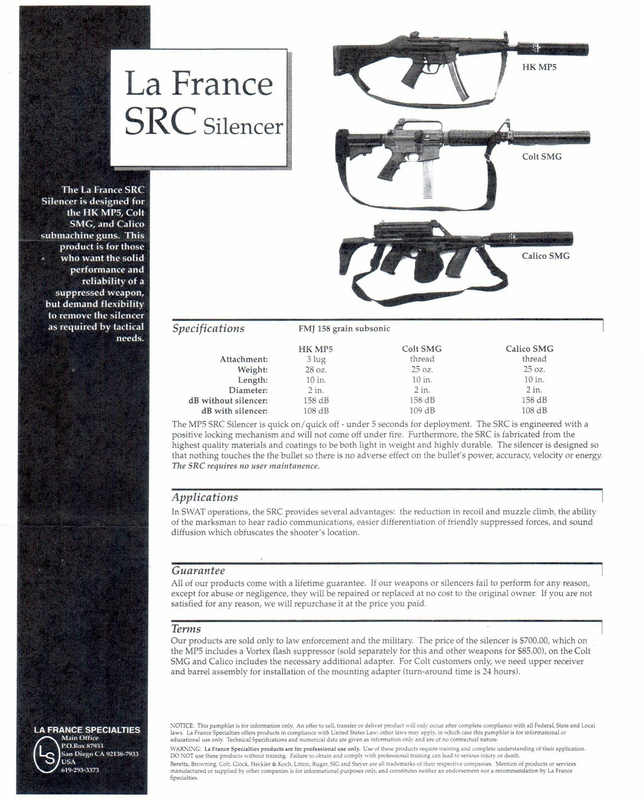 I submitted my order for the SRC HK MP5 suppressor. It has size and should compete nicely with Gemtech's MK-9K. Looking forward to hearing its tone. Please keep me in mind if you come across one of Tim LaFrance's trigger packs as I'm still searching. Suited for 25k rounds, lifetime guarantee & fully serviceable by the manufacturer. $600 each, and would be the quietest you've heard. 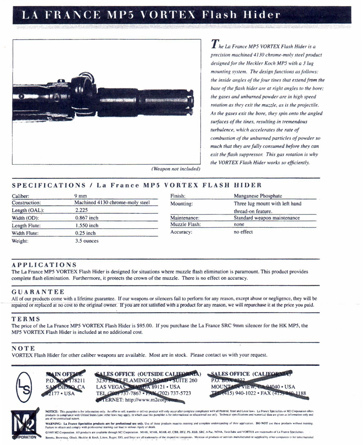 For the MP5 suppressor, he has 8 or 9 units in stock. For the M4/M16A2 cans, he has 9 or 10 units in stock. 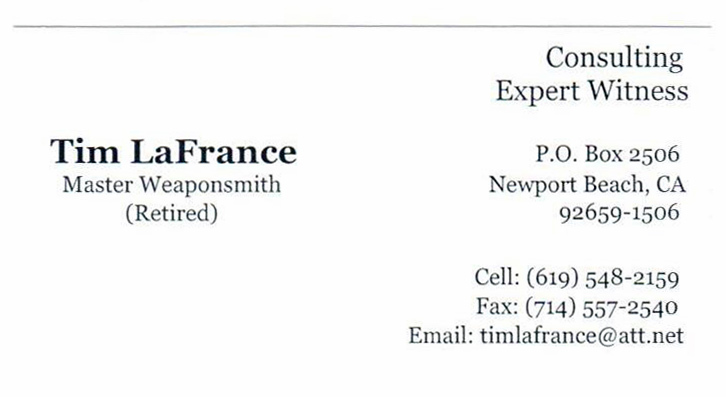 --> For ordering, contact Tim LaFrance directly (see biz card below). For more info, visit this thread. Neo, how were your LaFrance packs done? 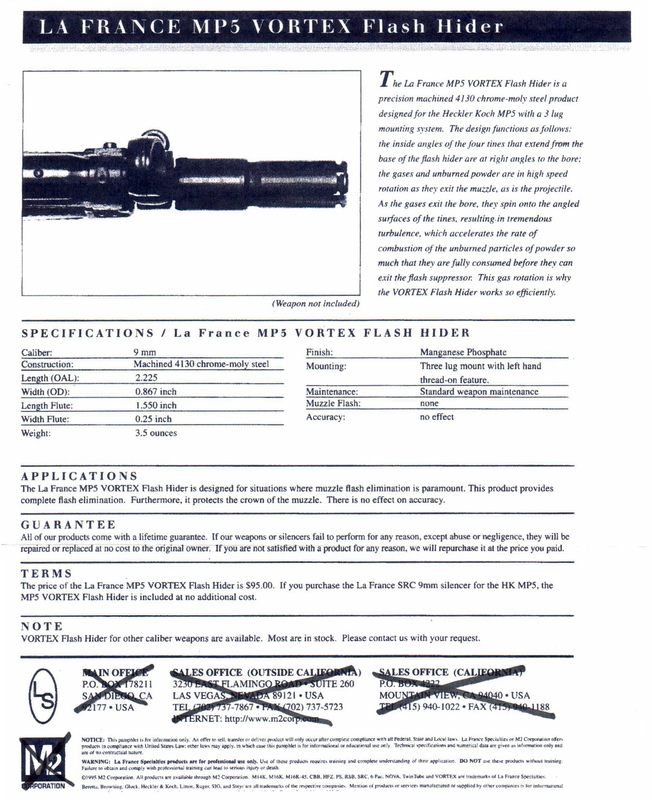 When I was looking for a registered frame, I considered LaFrance but was under the impression that they were semiauto frames with unserialized non-factory autosear. Is this the case? I had a LaFrance MP5 conversion at one time, and it was as you described. It was not a factory full auto frame cut to fit a shelf. Neo's may be different, but the one I had was most definitely built using a semi-automatic frame. The stamped/serialized component is the frame. They have the LS logo and the consistent 6 alpha numeric serial in the same location on each pack that I've come across (including other owners' packs I've compared with). Neither of mine should have components within the frame that are serialized, but I've heard of LS packs having internals that are marked. What also matters is how its registered on the form 3 or 4. My 1st LaFrance pack looks like a full auto frame that has a tiny shelf cut to fit on a a semi-auto shelf. This pack was modified by Terry Dryer to be ambidextrous 4-position with 2-round burst. My 2nd LaFrance pack looks like a regular DLO SEF frame, only because the shelf cut is so deep that I can no longer tell if it started out as a full-auto frame. It's currently in SEF configuration and will need to be converted to either ambi Navy or ambi 4-pos w/ 3-rnd burst. Regardless, any SEF frame that started as semi-auto can be converted to any 3 or 4 position ambi configuration by those are are willing to perform the modification: RDTS, Michael's Machines, Terry Dryer, or TSC Machine. But that's assuming that your frame is a candidate for said conversion, i.e., markings/logos/serials aren't in an area that are at risk of being obfuscated/truncated by the new holes and enlarged selector hole post modification. The primary incentive/benefit for this procedure (having a serialized frame instead of a sear) is that you can swap out your pack's original SEF internals with all new factory internals, so no more re-timed hammer & friction sear, for everything runs at factory spec using modern rolling sear. You can even have a qualified gunsmith convert an ambi frame back to SEF by welding on metal, though I can't imagine why you'd want to. The search is over. Deal was finalized for the 3rd and final HK LaFrance trigger pack, and my gunsmith confirmed that the recent two acquisitions can indeed be converted from SEF to ambi. As with all of my machine gun purchases, each pact was sealed by a completed (signed & dated by both parties) 2-page contract. So this is a done deal. Full bank wire payment (no 50/50) to be transferred after the seller provides his full T/T info, and the banks reopen for business. The scammers seem to prey almost exclusively on us HK buyers, so I'd recommend matching the form 3 or 4 with the seller's driver's licence, a phone call or two to get a feel for the seller, verifying the phone #'s area code and email IP with his geographical location, checking tax assessor records for a match of his home address, and finally but most importantly, protecting both you and the seller with an ironclad contract. After these past 2 weeks of searching, I can tell you that there are at least 16 self-proclaimed HK LaFrance pack owners over on HKPro, and I came across a few outside of HKpro as well, but I'm only buying this final pack. Thanks for everyone's correspondences and consideration with this project.